The high flying fight in the Finnish woods technically started back in January. Now Bear with me here. January the 11th to be exact. A plain clothed Norwegian seemed to be ‘just visiting’ the official launch of the WRC at the International Autosport show in Birmingham. Teams and their drivers took turns to come out on stage and announce their, mostly unchanged line up. But when it was the Citroen teams turn. The plain clothed Norwegian, Mads Ostberg had found himself a one off swedish drive and a pair of racing overalls – Rather awkwardly a spare set of Kris Meeke’s Race Overalls. Little did we know at the time, it would be more than just his race suit that Ostberg would be taking from Kris meeke 7 months down the line. Having had very little seat time and being thrown in at the deep end to replace Meeke after his questionable sacking for the second half of the year. Mads Ostberg put in a truly remarkable drive against one of the fastest drivers of the 2018 season. Friday’s high flying fight between Ott ‘Tornado’ Tanak and ‘mad’ Mads Ostberg was edge of the seat stuff. Unfortunately for me, I was still stuck in Birmingham. But thanks to the WRC promoters. I felt like I was there back in the woods of Finland with their incredible All Live WRC Plus subscription service. Worth every penny. Unfortunately my weekend was written off, as I was on the edge of my sofa for most of the 3 and a bit days of action glued to my laptop screen. Ok, Ott Tanak didn’t have the best road position. Ostberg did. But let’s balance that out. Because as I said here at the beginning, Ostberg has had very little seat time in a car that still needs a lot of improvement And development. Thankfully the Citroen C3 was finally on pace this weekend. With both Ostberg and Craig Breen setting top 2 fastest times in pre-event Shakedown. The Friday battle was hot. Mads & Ott swapping the lead, often with just tenths of seconds between them. But when Saturday came. Tanak was just untouchable and continued to creep open the gap until he crossed the flying finish. Literally. Mads settled for 2nd for what was a very important result both for Mads Ostberg and especially for Citroen, after their rather disastrous year so far. Esapekka Lappi was another stand out driver. Last years winner put in an amazing performance but crashed out at the end of the first stage on Sunday morning, crossing the line on foot. Home hero Jari Matti Latvala gave it everything and managed to get on the last step of the podium. But Ostberg & Tanak were just too far out of reach. Hayden Paddon, who is on a part time drive with Sordo this year was the best placed Hyundai, with his best Rally Finland result of 4th. Such was the speed and competition from the other drivers. The title battle between Neuville & Ogier took a back seat this time. Ogier was helped into 5th by his team mates Evans and Suninen, who also put in some great performances. Thierry Neuville spent most of his time sweeping what must have been one of the hottest and rough rally Finland’s for a long time. He only managed 9th. Meaning Ogier was able to close the championship points gap to Neuville. The Belgium leads the title fight by 21 points. It’s important that we don’t forget about the support classes. 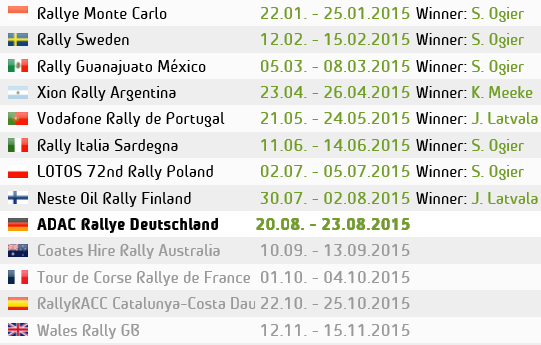 As these drivers in WRC2 and the Junior WRC will be the stars of the future. One of the biggest stars of the future – Rallying’s equivalent to Max Verstappen. Is 17 year old Kalle Rovanpera. He took the internet world by storm when he was just 8 years old, throwing a rally around a snow covered lake on youtube. Showing unbelievable skills that someone 10 years older could only dream of mastering. The young Finn dominated his home rally in his Skoda Fabia. Until the front left suspension mount couldn’t keep up with his flying pace. His spring had sprung, along with the damper and bounced off into the trees. But Rovanpera never gave up. He dragged the car to the end. Thought it was all over. Until they managed some road side repairs. Using a steering arm and straps to try and hold the car together for the final stage of Saturday. He made it back to service but the damage had been done. Lead gone, however he still impressed the world with his pace & survival skills to finish 4th. Just behind Brit driver Gus Greensmith. With Hyundai’s junior apprentice 2nd and privateer driver Eerik Pietarinen winning the WRC2 class. This year’s FIA Junior World Rally Championship has been full of hot fought battles with these young stars of the future. The weekend got even better for Estonian fans, as Ken Torn secured his maiden victory after an intense fight with Sweden’s Emil Bergkvist. Torn took the lead on Thursday night. But Bergkvist held the lead in the forests for most of Friday until a puncture dropped him 20 seconds behind his rival. Torn went into the final day with a 12.7 second lead. Bergkvist tried all he could to close the gap, but it just wasn’t enough, as Torn crossed the flying finish to thousands of cheering Estonian fans to take victory by 9.9 seconds. Jean-Baptiste Franceschi rounded off the top-three. But Bergkvist wasn’t too disappointed, as his 2nd place finish, along with championship-leader Dennis Rådström failing to make it to the end after a heavy crash with roll cage damage preventing him from continuing. Bergkvist now leads the way ahead of Rådström and Franceschi with Torn not far behind. The final round of the JWRC takes place at Rally Turkey next month and, with double points on offer, a thrilling finale awaits!